(Jakarta, June 19th 2014) - Archipelago International is once again holding their annual Job Fair to recruit and interact with Indonesia's best talents. The fair is was held on Saturday 14th June 2014 at Sekolah Tinggi Pariwisata AMPTA in Yogyakarta, following last year's event in Jakarta which attracted 1100 visitors. With an expected turnout of over 500 visitors, the objective of the job fair is to raise awareness of the brand and to attract the right talents to Archipelago's team. Not only will the fair attract jobseekers, it will also introduce the public to the idea of a career path at Archipelago International, to inform them of the benefits a career in hospitality provides. For interested applicants who are not currently working in the industry, there are a number of programs on offer to help with the transition, like the “Inter Hotel Staff Transfer” and the “Cross Exposure Program”. Therefore, the event is available for all employees from various lines of work, including students and graduates of hotel schools and general universities. For the upcoming year, Archipelago International will require more than 2000 staff members for managerial and supervisor roles, ready to be placed in the already-opened and pre-opening hotels. “Our main goal for the annual job fair is to raise awareness of our brand to all jobseekers and the public alike. Archipelago International is always looking for talented people to grow with our developing company. With our 11 brands ranging from 5-star to 2-star hotels and villas, we believe our hotel group offers the largest number of job vacancies in Indonesia. The current positions available can be found at our website: www.ArchipelagoInternational.com and you can register your resume together with a recent photograph by clicking on: www.AstonData.com/Jobs/ or email it to: Jobs@ArchipelagoInternational.com” Says Lukas K. Samali, Archipelago International's VP Human Resources. Seen in the picture - From left to right side, Mr. DRS. Prihatno, MM (Assistant Chairman of STP AMPTA), Mr. DRS. H Santosa, MM (Chairman of STP AMPTA), Mrs. Anggie Anugrah (Corp Recruitment and Database Manager of Archipelago International), Mr. Lukas K. Samali (VP Human Resources of Archipelago International). Handover MOU, agreement between Archipelago International hotels unit and Sekolah Tinggi Pariwisata AMPTA Yogyakarta. 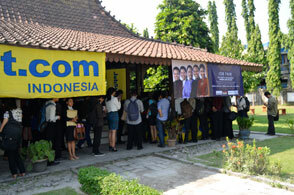 Seen in the picture - Jobseekers / visitors during the Job Fair. Seen in the picture - Event venue at Sekolah Tinggi Pariwisata AMPTA in Yogyakarta.